There is nothing quite like a fresh sweet slice of pineapple- something about it transports you to somewhere tropical where the only care in the world is which bathing suit you are going to wear + what book you are going to read while the crashing of waves, the only soundtrack you need. Pineapple is a pretty amazing fruit not only for it's taste but also for the many health + beauty benefits it contains. The most notable benefit in pineapple is Bromelain, a proteolytic enzyme. Proteolytic means "breaks down protein", which is why pineapple is known to be a digestive aid. It helps the body digest proteins more efficiently. Bromelain is also considered an effective anti-inflammatory. Regular ingestion of at least one half cup of fresh pineapple daily has been found to relieve painful joints + has been proven to produce mild pain relief as well as help build stronger bones. In Germany, Bromelain is approved as a post-injury medication because it is thought to reduce inflammation and swelling. Interestingly, it also has a long history in folk medicine and natural beauty treatments. It's a natural source of alpha-hydroxy acid, which helps with exfoliation. 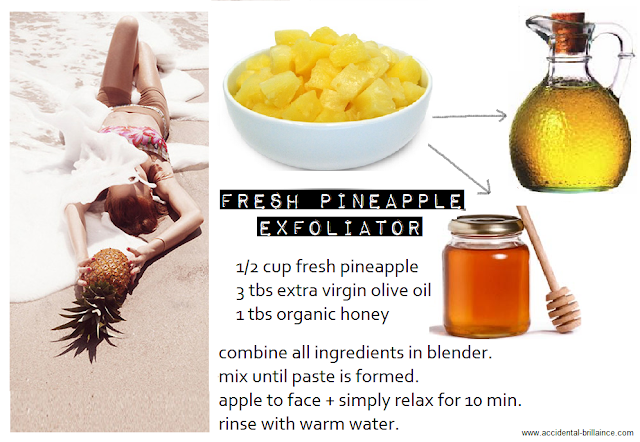 There are a number of simple ways to use pineapple on your skin but a homemade mask is a great way to get rid of dead skin cells + reduce dullness leaving you with shiny, bright, refreshed skin. And, I guess if you can't get away for a little vacation, this mask is an instant way to give yourself a few minutes to just chill out.